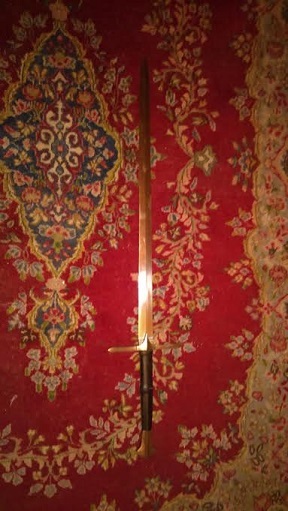 Forum Index > Historical Arms Talk > Recognize this longsword? 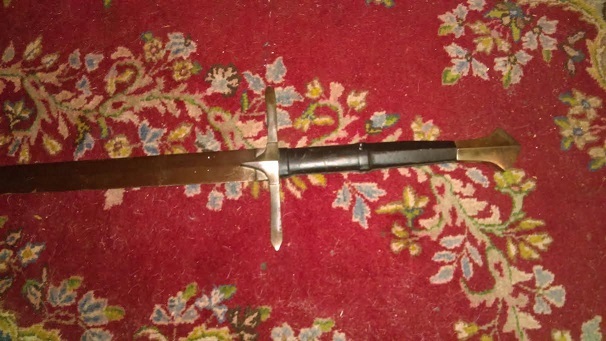 Posted: Wed 07 Sep, 2016 8:58 pm Post subject: Recognize this longsword? Anyone recognize who makes this critter? Looks familiar, but I can't put my finger on it. Pretty nice sword actually with a really great balance. Threaded pommel. Stitched leather covered grip. Blade is dull with a good temper. Fit and finish are good especially the guard and pommel. Not a mark on the whole thing, no country or maker. Balances and handles like it was ment to be a practice weapon for longsword. Dull as in never been sharpened. No scabbard. I'd sell for $150 and $15 for shipping conus. I'm pretty good at figuring where european swords are from and this one has got me.